Back in June this year, Microsoft announced that they were cutting Microsoft Money. Now, I've been using this app for well over 14 years now (my transactions go back to July 1995), and so I was a little peeved, to put it mildly. I know that the application itself will continue to work — although at some point I would be unable to install it on any new PCs or hard drives I may get: there's good old activation for you — but the online features would also be cut off at some future point. No more automatic downloading of transactional data from the banks I use. At the time they made the announcement, they also said they were going to be working with Intuit to provide a complete conversion program that would convert from the MS Money data format to the Quicken format, hinting in the process that Quicken was the way to go. This evening, when I went to login to Money, a dialog came up giving me a $10 off coupon for Quicken 2010. Sure, why not, I thought: I might as well try it. The nearest level to my Money Deluxe was Quicken Deluxe ($50 after the $10 off), so I entered my credit card details and purchased it on right there and then. After I'd done my transactions for the evening in Money, I shut it down and prepared to spend a little time with Quicken. I installed it. Therein was my first issue. Without asking or providing an "advanced" wizard page, the install slapped four icons onto my desktop. The first would have just about been allowable — all right I confess, a blatant lie: I use Windows 7 now and before that Vista. I love the new Start Menu: I can type faster to launch an app than I can search for its icon under the windows I have open. For Money, it's Windows key, M-O-N, Enter. Blam, it's running. 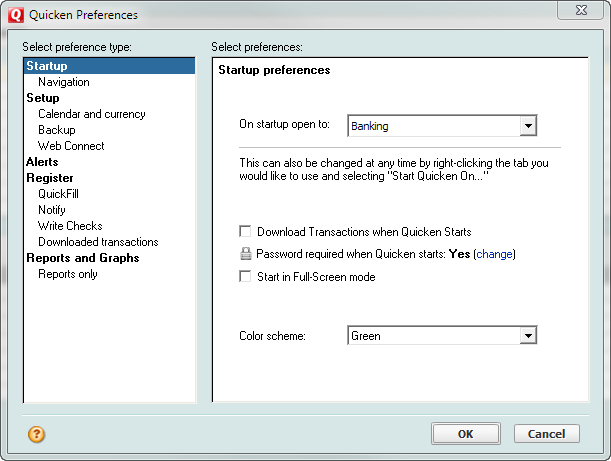 Quicken will probably be Q-U-I, Enter. Putting icons on desktops is passé. If the first icon is semi-allowable, the other three are flagrantly obnoxious and egregious. For your edification, we have "Best Card for Quicken users - Great NEW rewards", "Free Credit Report and Score", and "One Month FREE - pay bills right from Quicken". Excuse me? Some really tacky sales pitches because, you know, the $50 I just paid is not enough? I'm not installing an evaluation version, I'm installing a paid version. I am a PAYING customer, Intuit, not someone watching commercials on TV. No I don't want a stupid-assed credit card with "Quicken" on the front, I know quite well how to get my free annual credit report (besides which I pay for a monitoring service), there no way I want to pay someone else to pay my bills for me. So some nasty egregious sales stuff. After taking the image you see above I deleted them all. I then ran Quicken. It asked me whether I wanted to create a new database or import one. I selected the "Import Money database" option and it asked me for my credentials. But, whoa, look at that dialog. Boy, is that some ugly look-and-feel. Hello? I'm using Windows 7 here (but you can pretend that it's Vista) and Aero is fully active. WTF are those tacky buttons with the bold text? And the MS Sans Serif font? Did I slip back to Windows 95 and no one told me? It's easy enough to query the user's Windows theme and get it right, surely. Anyway, it found my existing database and went off to do its stuff. After a little while it came back and said there were issues and it had created a log. This was the next problem on my list. The log it created was in HTML format. And it displayed it in a separate window with what looked to be a Quicken browser. WTF? 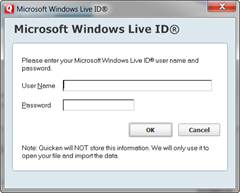 The only options it gave me essentially was to close the window or print the data. WT-double-F? What about, you know, an option to save the friggin' log? Luckily there was another option to view it in an external browser. Up came Firefox and I then saved it from there. Now, I realize that Money itself, by default, shows HTML content inside its main window (it basically runs IE as a COM object), but at least it makes the effort to make the HTML browsing seamless with the Money window itself. It doesn't pop open a new window with a naff toolbar and try to pass itself off as some kind of real browser. It's all integrated into the look and feel of Money. The next issue is minor: a spelling mistake in the log, but come on. "Schdeuled"? The text with this error stated: "To identify the scheduled transaction that was not imported, look for a message in the Details section that says "Failed to convert the X scheduled transaction to Quicken", where X is the name of the payee for the scheduled transaction." Therein lies the next issue, as you can see. The detail section for this error did anything but identify the payee, but at the same time propagated the spelling error. Now I was in the app itself. Hooray. 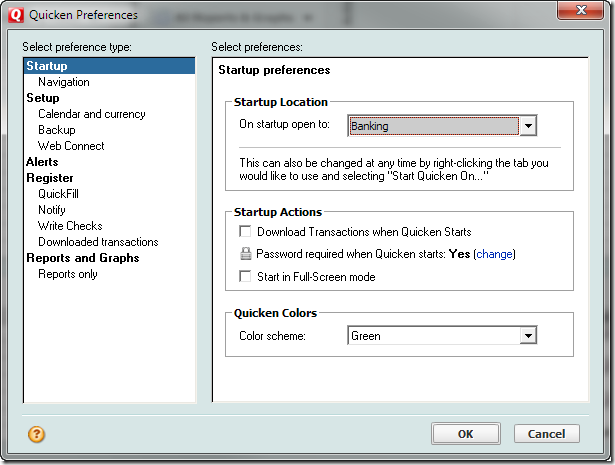 First thing was to customize Quicken. I hate seeing the home page when I start up Money, so the same would apply to Quicken. I just want to see my accounts, thanks very much. I found the "Quicken Preferences" menu option and came across another dialog from the last century. Let's dissect. Again, it's good old bit-mapped MS San Serif again, even in bold. But wait! If you look carefully you'll see that the group headers are another font entirely (look at the word "Startup" in both the panel title and the first group header). It's the same font as used in the buttons (which aren't standard anyway). Look at those black shadow lines, mmm-hmm. All kinds of awesome. Again, it's some Windows 95 look to the controls themselves. But get this: if you press Tab a few times the group boxes and headers disappear! Hey presto! The groups disappear! And they don't come back with more Tab presses. No, I didn't Photoshop this, but man this is just delicious. I could show you the fonts dialog here (the listbox shows four, count 'em, 4, visible font names with a teensy weensy scrollbar to scroll through the full list) but we'll move onto the real meat of the app: the transaction window, where I spend most of my time. It seems that Quicken will only display the transaction grid with two lines per row. On the first line you get the date, the the payee, the amount, etc, and on the second line the category and the Memo. You can't get rid of the second line, not that I can see, and it's downright annoying. When I'm talking an overall look at my transactions I'm just not that interested in the category and memo. No, really. I'm just interested in when I paid the payee and how much. The reason for the two lines is that you also edit in the grid. Now you can do this in Money (I'd turned it off), but I find it inefficient. I'd rather edit in a separate pane. I suppose that's no longer an option for me. My final issue in this initial pass is this. There's an overview view of a particular account. 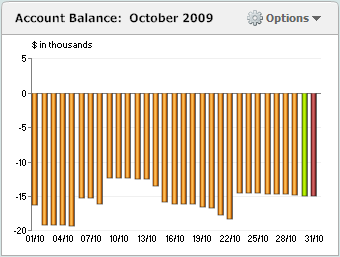 Kind of nifty, shows the current balance, etc, some details about the account, what you've been spending on category-wise, and a nice graph showing the account balance for the month. Unlike me being reticent about showing you what I don't like about the transaction page because it might reveal more than I'd like about my spending habits, I have absolutely no qualms about showing you the Account Balance chart of my main current checking account. It's there on the right. Yes, you didn't read it wrong: it shows that as of today I am $15,000 in the red. I'm causing the banking crisis all by myself. Except... I've never gone overdrawn on this account. In fact right now, it's nice and healthily in the black, as the previous pane in the Overview window would readily show. A good job too, since the mortgage payments are due in a couple of days. And it's not like they got the signs wrong: although I wish I had $15K in my checking account, it's nowhere near that. So it's not upside down either. It's not even showing what I owe summed across all my accounts, checking and credit. I have absolutely no idea where it's getting this data from. No idea at all. No idea what this chart is supposed to show. Time to shut the app down and ponder on whether I just wasted $50. Your first impressions are about like mine. I did the Money import, it pulled in everything. Even bills from 5 years ago that I had deleted to payees I don't even have accounts with. That was when I decided if I'm going to use Quicken, I'm just going to archive Money (painful) and start a new on the first of the month. Well, tomorrow is the first and I don't know if I can bite the bullet. Home and Business is particularly awful looking with the dialogs. Creating an invoice? Absolutley terrifying dialog. They should hire DX to come in and polish their UI and make this thing usable. I curse Microsoft for abandoning me and throwing me to Intuit. 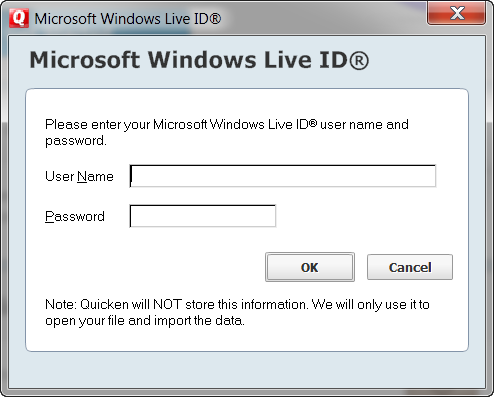 I'm a long time Quicken user, and I've liked it less and less with every release. I'm currently on Quicken 2009, and everything I've read indicates you should avoid Quicken 2010 like the plague. Good luck if you need technical support -- I've been trying to resolve a patching issue for Quicken 2009 Release 7 for over a week. Their hot fix doesn't work for me. Their email support rejects my emails because I have a different originating email address (on the same domain) than their replies go to. I just waited for an "instant chat" for over a half hour -- a chat that's SUPPOSED to be available 24x7. When I finally got down to first in the queue (I had no idea "4 seconds" could take more than 2 minutes) the chat request was canceled -- not by me or anything I did, but by someone on their end, because there is now no one available on their 24x7 chat system. Maybe the new guy in charge of Quicken will straighten up its act, but that's going to take at LEAST 3 years while they merge his web application for money management into the Quicken fold. Ironically, I was just about to look at MS Money again as a replacement for Quicken when I learned it was being canned. This sounds like a GREAT business opportunity for someone who knows how to code and knows the financial world. As of now, I'm extremely unimpressed with Quicken and would entertain almost any alternative. Just got another email from them, with a full download install, and instructions to not only uninstall my current version, but manually delete several other things off my hard drive, then try their full install again. So -- if that doesn't work, I'll be stuck without my money management software for who knows how long. Wish me luck! John: Yeah, well good luck with that. I'm back to Money again after I discovered a black-and-white icon for their Billminder program. Yes, that's black and white. No grey, no antialiasing, a nice pixellated two-color icon. It's like no one cares. To be honest, who knows what the mint.com crew are going to be able to do with this, if anything (and if they're going to be allowed to do anything, for that matter). I have been using Quicken since about 94. Before that I wrote my own system in TP in the late 80s. Since 2000, Quicken has been steadily getting worse. I won't "upgrade" to 2010. This does seem like an excellent opportunity for someone starting a business, knowing that MSFT is not going to be in that arena any more. I don't really care much if they use black and white icons or 80s fonts, but when the data gets corrupted, I worry. After all, it's a financial program. Isn't it?